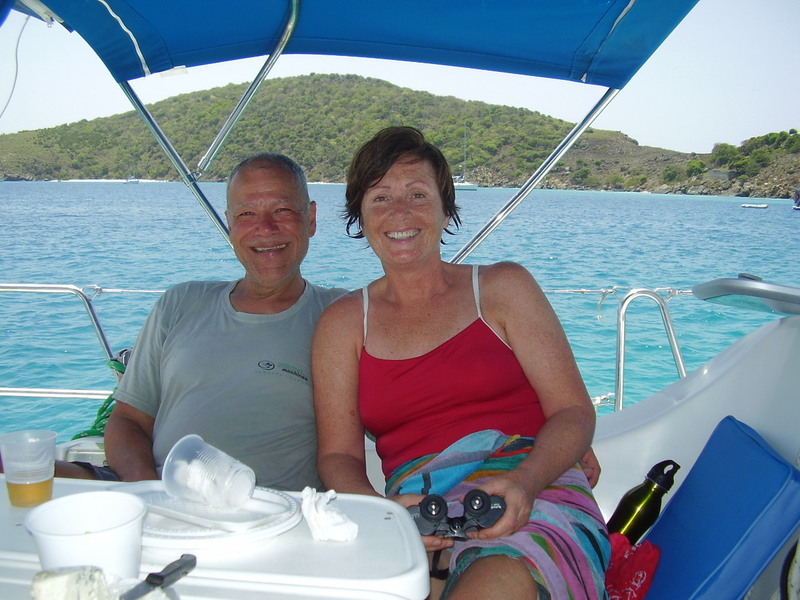 Every time I look at old photo’s of our previous trips down to the BVI I think I should post some of them to my blog so that all 2015 cruisers can start to visualize whats around the corner. 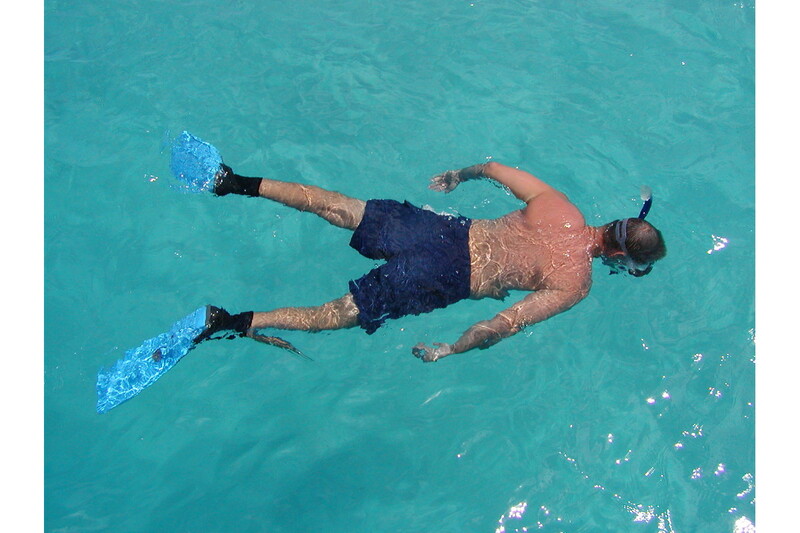 By the way, the banner photo above was taken at Sandy Spit, our favorite day anchorage to swim, explore and simply mellow out. 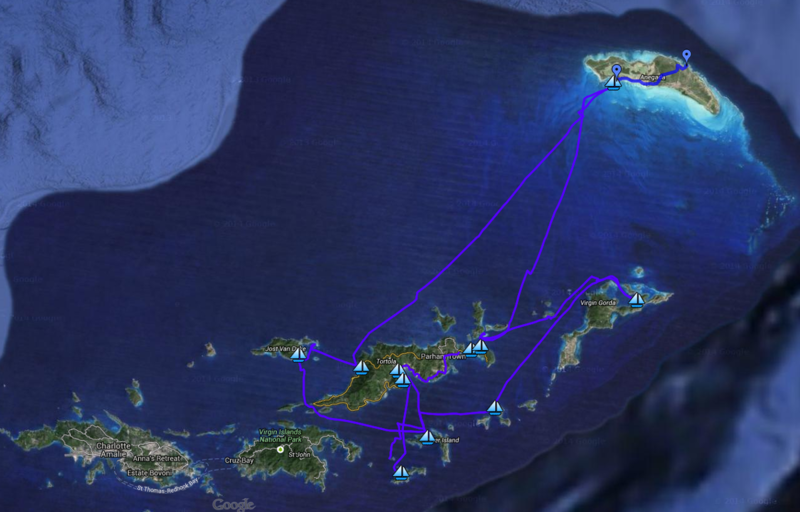 In 2010 I made a GPS track and imported it into Google Maps, here is a snapshot of it: If you want the full experience and are licensed to surf, Click here for the Google Maps version. 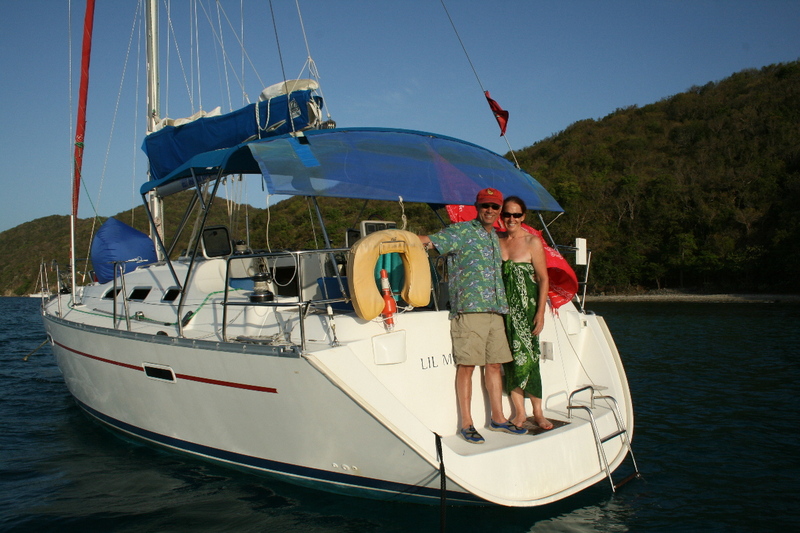 Most of the photo’s are from 2010 with a few from 2002 like the one below of Conch Charters where we’ll be picking up our cat. Don’t let the telephone wires and rusty shed put you off, focus on the boats, that’s where we’ll be and out far from the metropolis of Road Town. 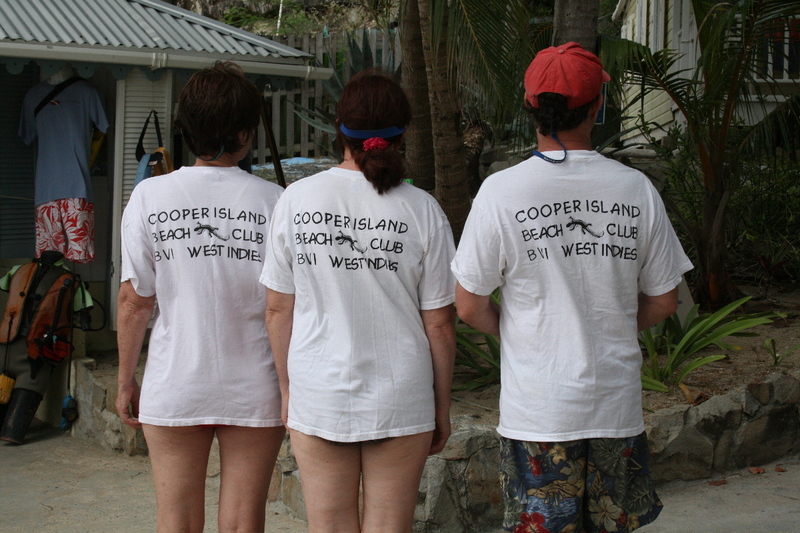 Cooper Island was often an early stop and they have a dress code. Front and back that is. 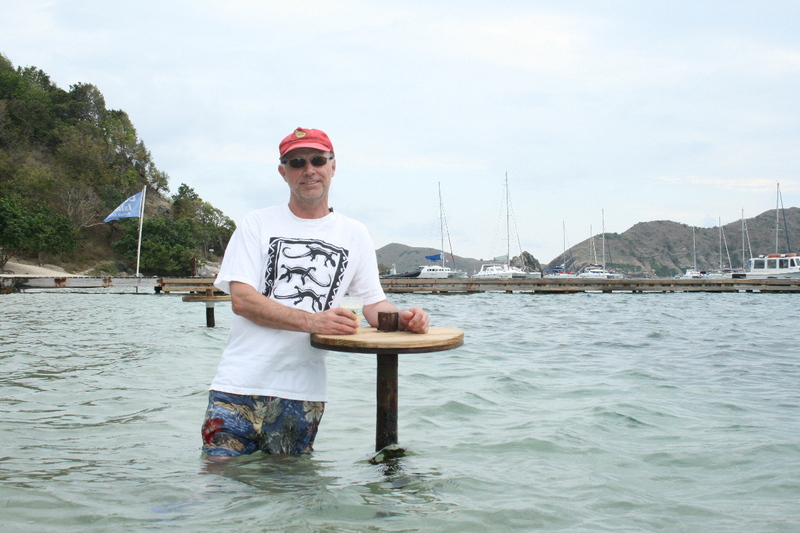 High tide did not stop Jerry’s happy hour. 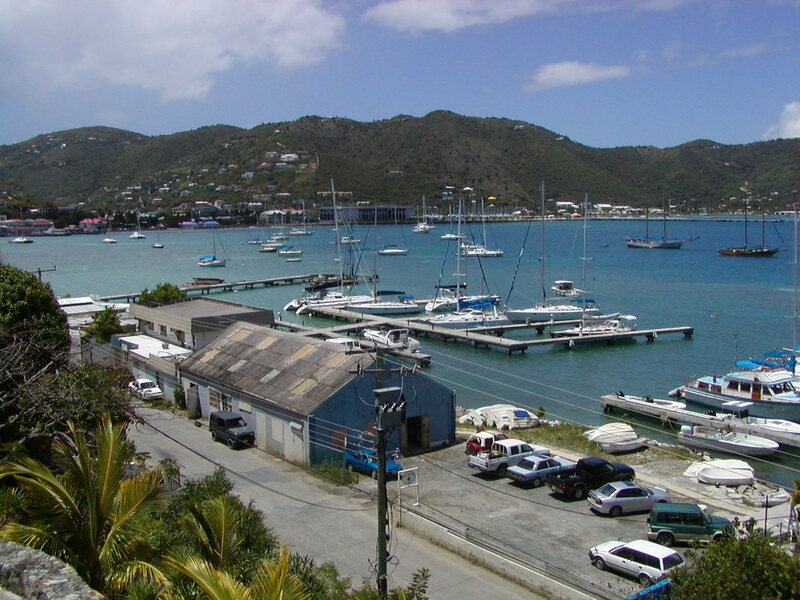 I believe this is Cooper’s dingy dock, you’ll see many of them, and all the dingy’s all look the same when you are ready to ferry back to your boat. 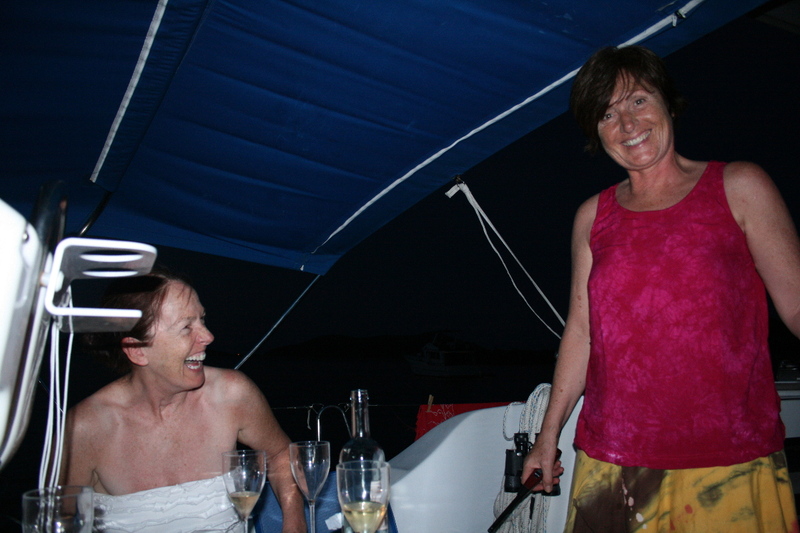 2002 rail meat as Jerry fills the sails with wind in Sir Francis Drake Channel which will take us up to Trellis Bay. If Rose can remember what she said I will update this post with an appropriate caption. 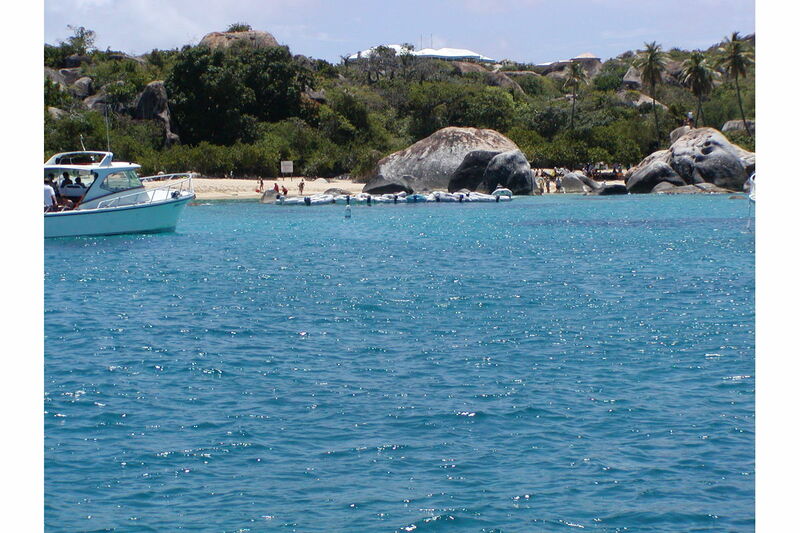 Next stop will be The Baths, haven’t been there since 2002 so it’ll ne new for all of us. 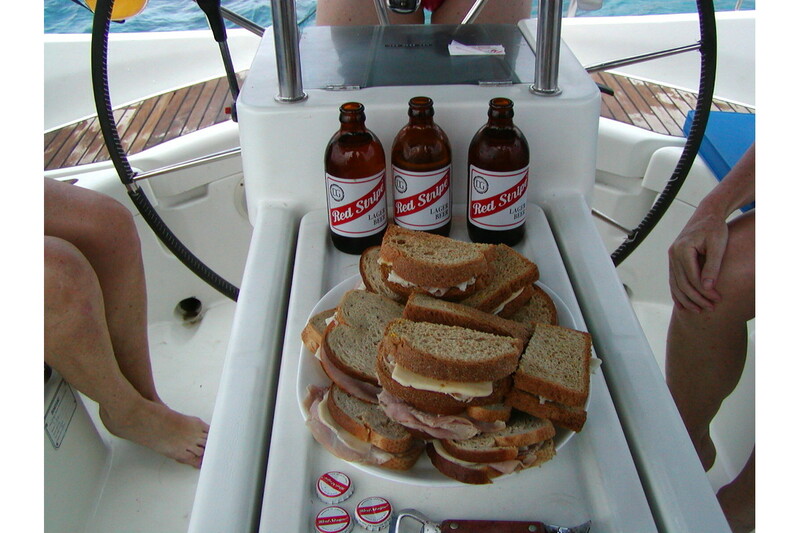 Another great snorkel stop is The Dogs with lunch served on deck afterwards. Callaghan’s, please note the choice of beers available – pick any one of the three. 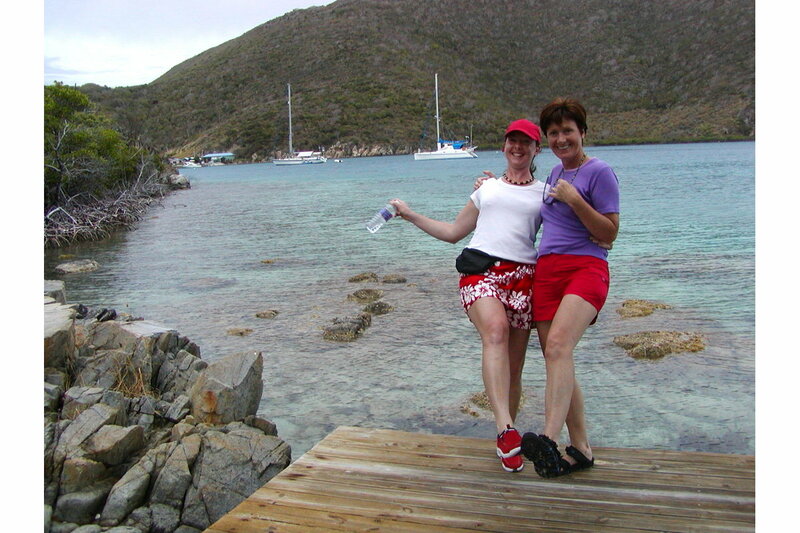 Here’s a great photo of Rose & Rhonda at The Bitter End in the North Sound and no, they did not fall in. 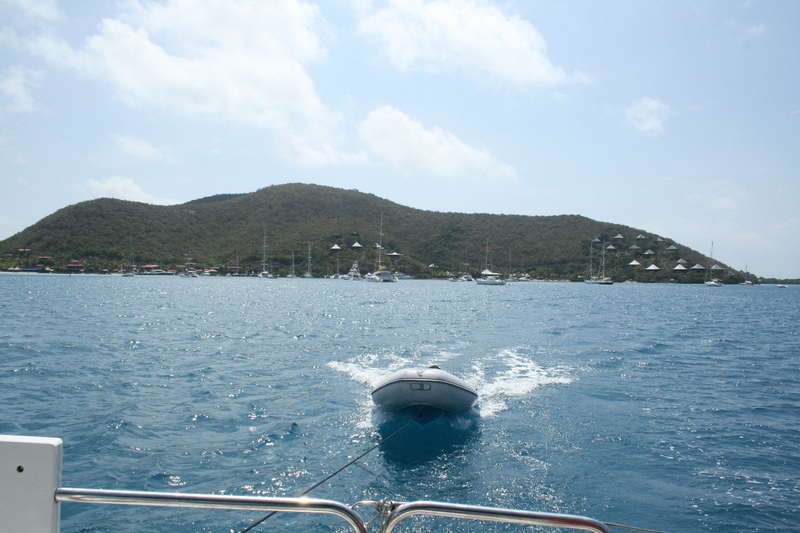 Leaving the North Sound and heading out for Anegada to the north east. 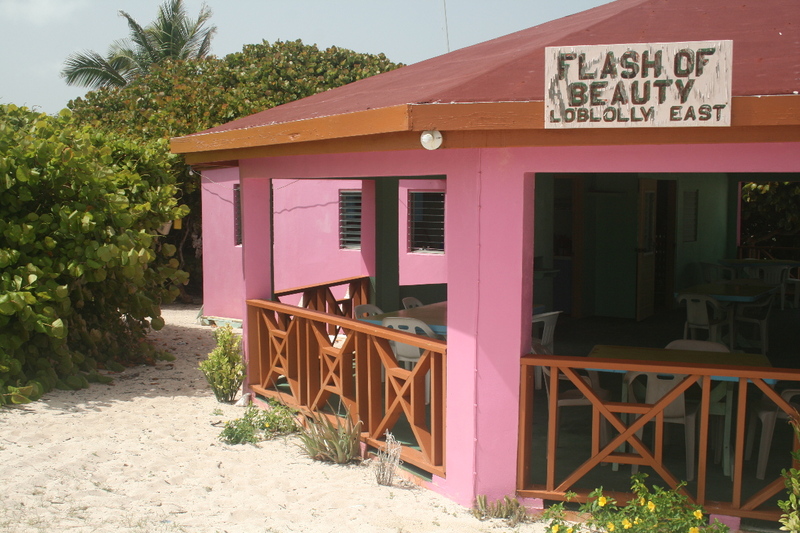 From the anchorage on the south side we took a taxi over to Flash of Beauty which has the best snorkeling around. 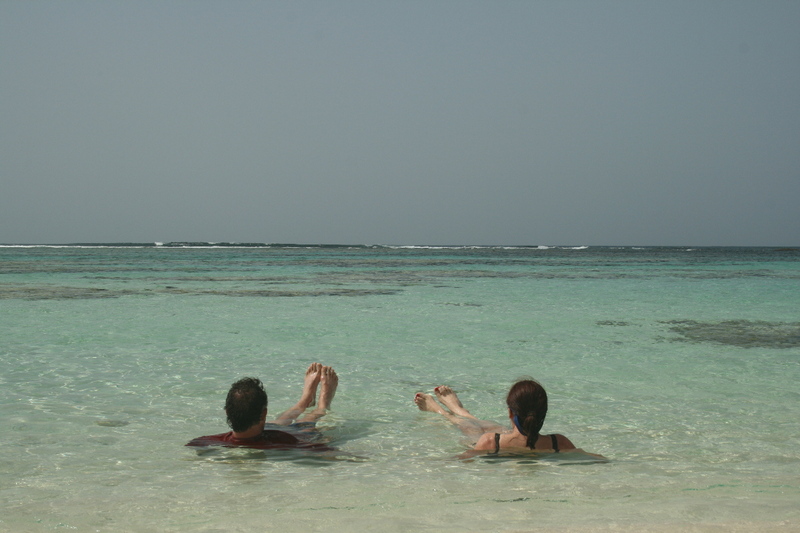 Ann & Jerry – we could get used to this. 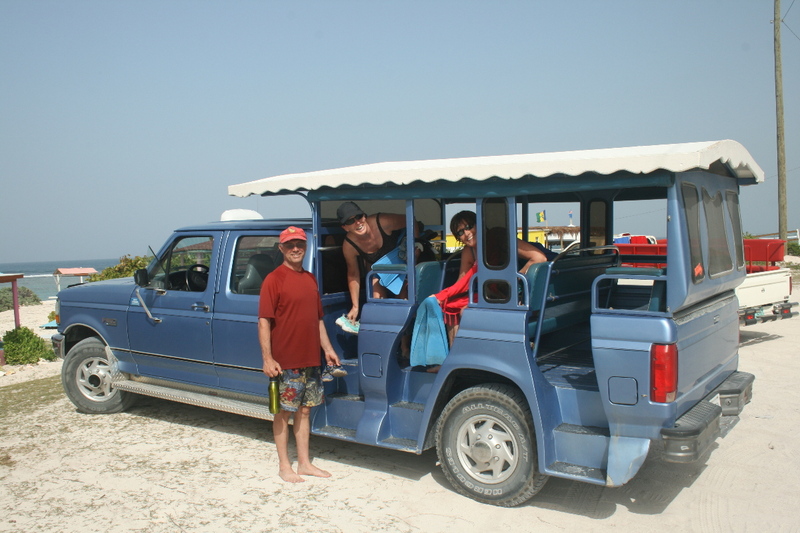 Our taxi – Anegada style. 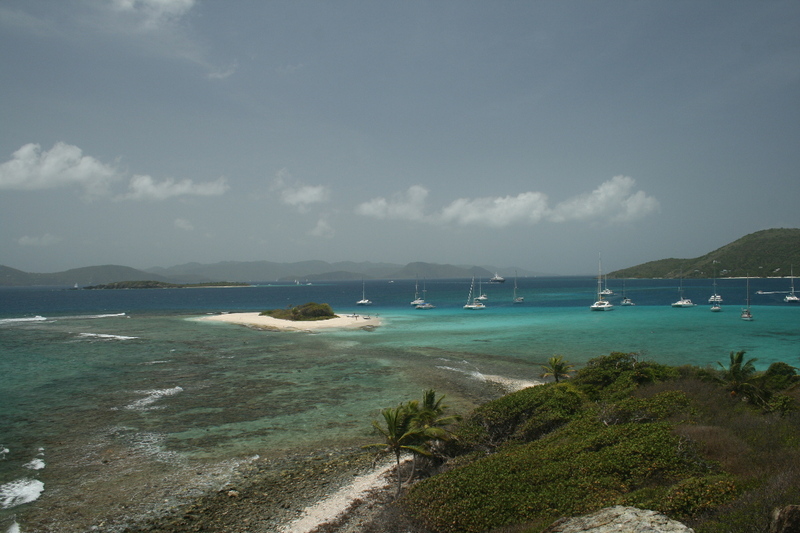 Back to Sandy Spit off of Jost van Dyke, that’s the Spit you see with with the boats to the right. 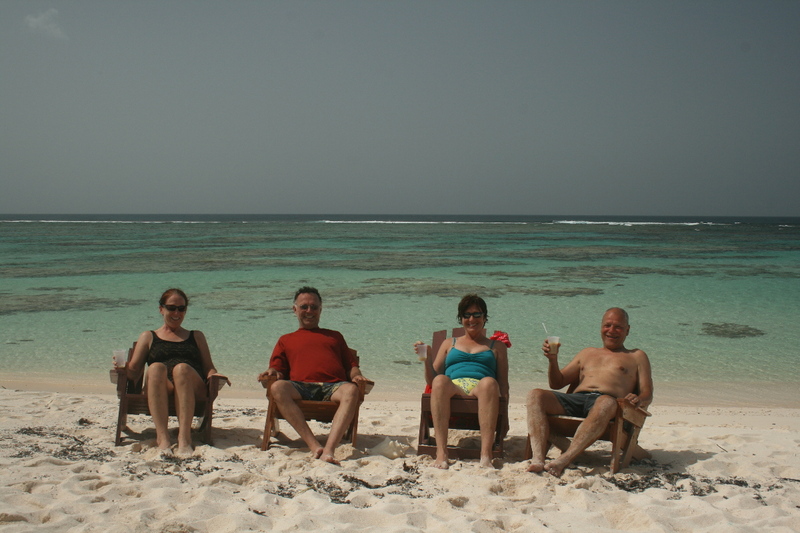 There is also a larger Sandy Cay in the background that we have not visited. 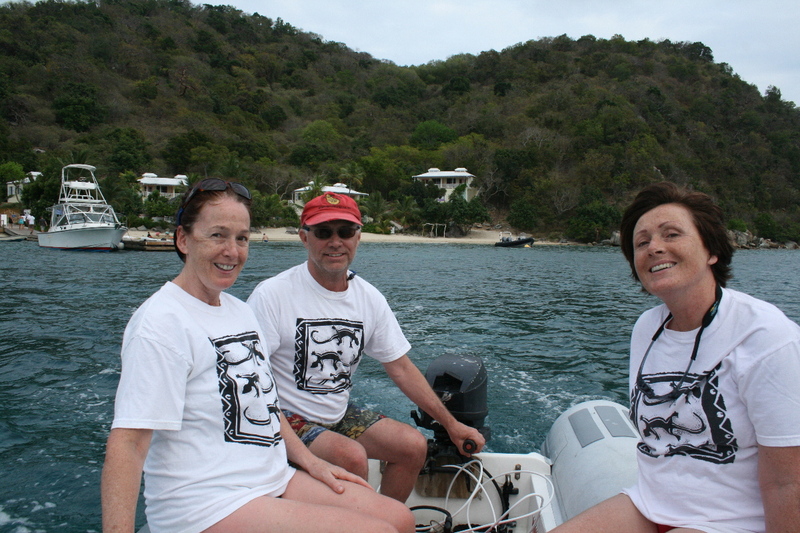 There is always some cajoling to get the Malone’s into the water and then there’s Dan below, could be sleeping …..
Then it was over to Little Harbor on Jost and a quick dingy to Sidney’s Peace & Love (mix your own). 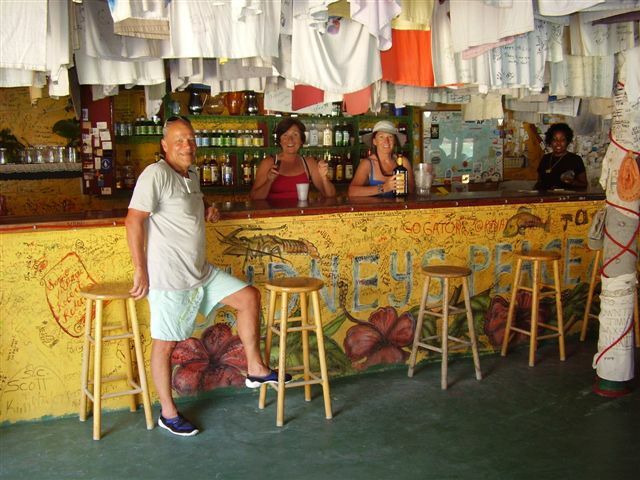 We asked for a drink and the barmaid on the right said we should mix our own. 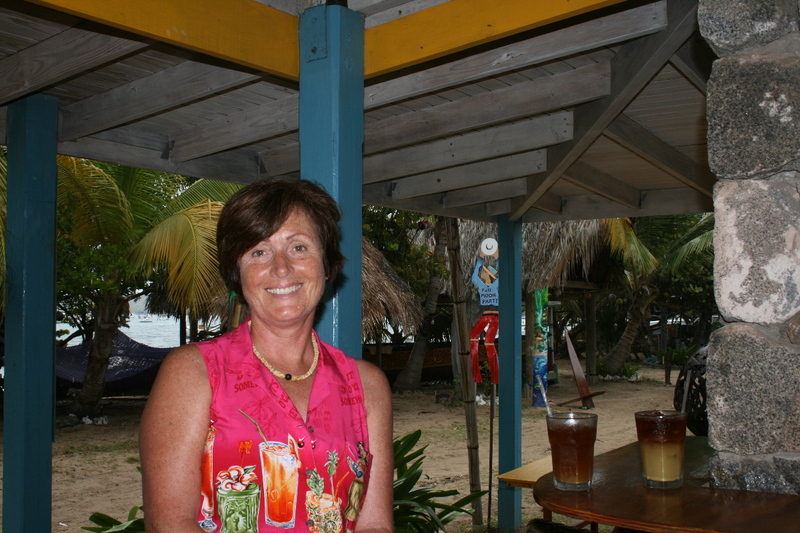 The Malone’s were quick to find their way behind the bar and mix away, they could be locals don’t you think? 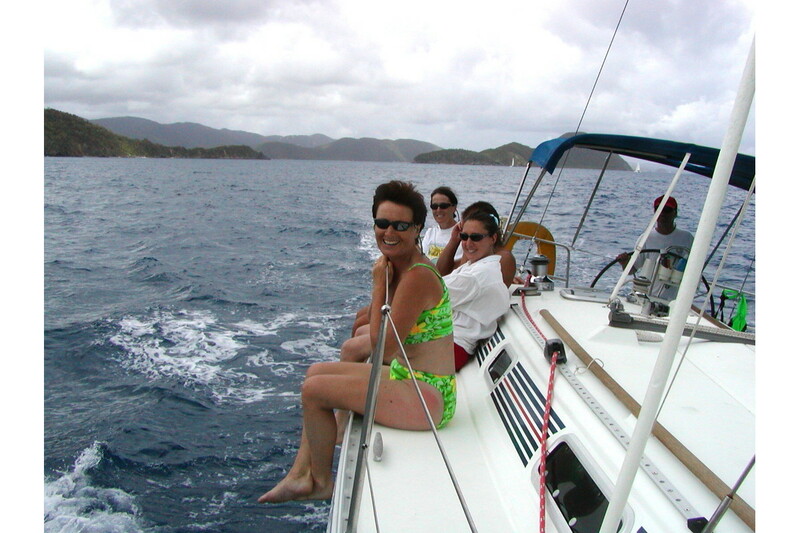 Dingy riding. This might have been Coopers from the dress attire – photo out of order …. Wake up Jerry, the 10 days are almost over and then you need to give it back – the boat that is. 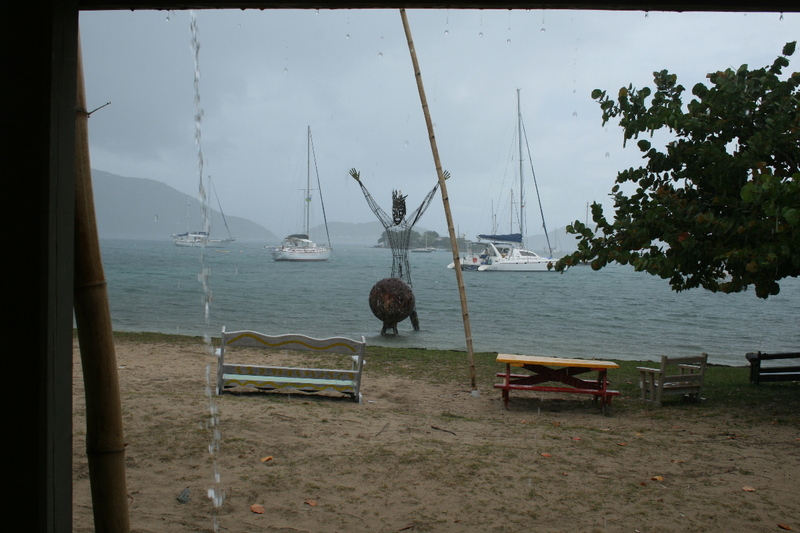 Last day it rained as we crossed the channel to give the boat back. 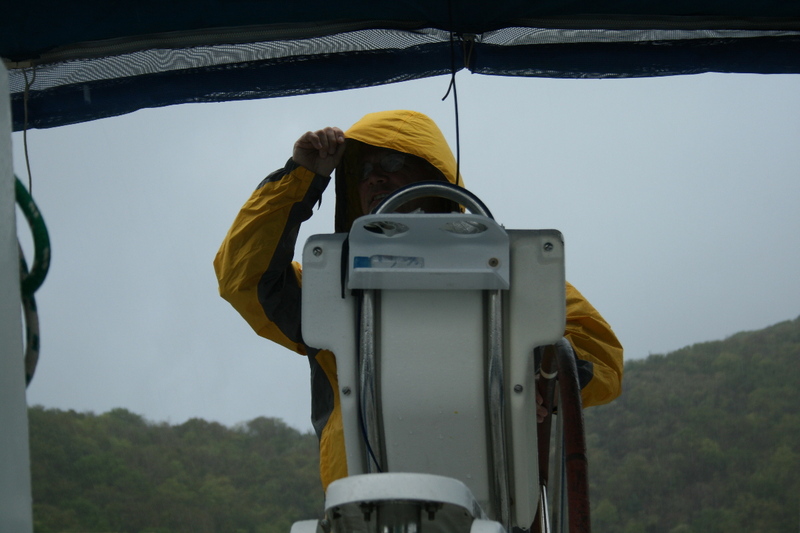 Jerry always says that if he brings his (yellow) foul weather gear it will not rain – not true this year. 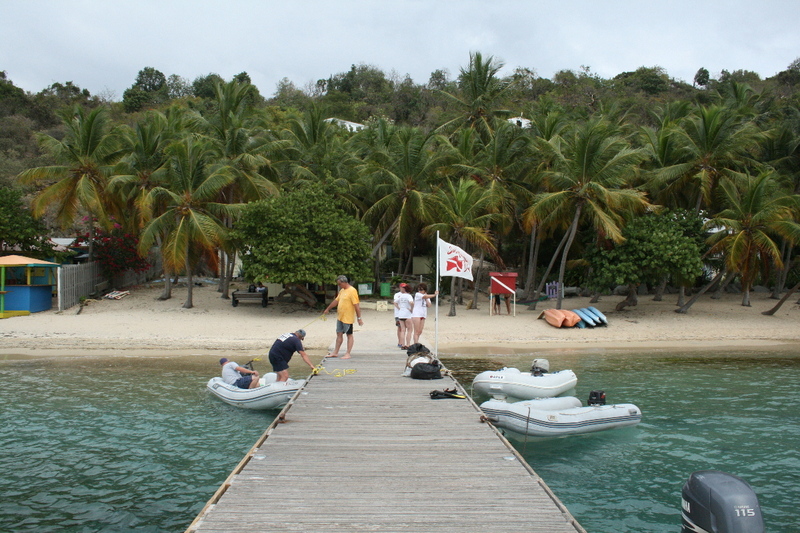 If flying out of Beef Island on Tortola you can check in and then nip down to the waters edge for a last drink. 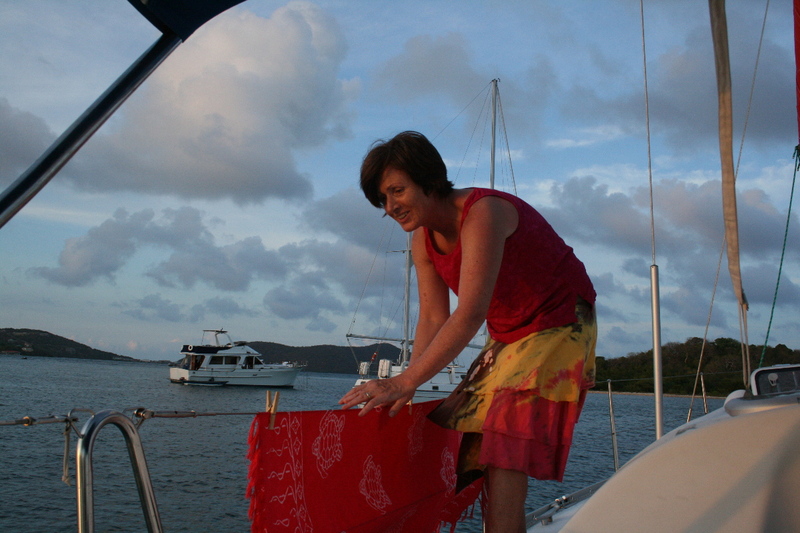 That was it – another unforgettable BVI sailing trip. Fabulous pictures. Really looking forward to the trip of a lifetime. This is the best time as it is all ahead.